While the spring weather in New England has been unremarkably "normal", Japan has experienced a record warm spring. March was the warmest on record for 35 of the 140 weather observatories around Japan that have been recording weather since 1953. Regular readers of this blog will not be surprised then that the cherry blossom season was record early. I know of no culture as fascinated by signs of spring as the Japanese, and the flowering of cherry trees is a greatly anticipated national event. Hanami, or cherry blossom viewing, is a popular Japanese pastime and has been for many hundreds of years. Each spring authorities attempt to predict the date of peak cherry flowering so that people can plan parties under the ephemeral blossoms. This spring, cherry flowering was 10 days earlier than predicted in Tokyo and was 15 days earlier than last year. Summer-like temperatures in March, including an astonishing 25.3˚C on 10 March, are to blame for the early flowers that are tied with 2002 for the earliest on record. Of course this early spring did not stop large crowds of people from enjoying the flowers. Throughout Tokyo, parks and temple grounds were overflowing with groups of families, friends and co-workers eating and drinking under the dense canopy of beautiful blooms. Over the past few years Primack Lab members have been collaborating with folks from the Concord Museum on an exhibit showcasing our work in Concord over the past 10 years, as well as historical artifacts focused on the long history of natural observation in Concord. After years of planning, brainstorming, and meetings, followed by several months of intense preparation, we are pleased to announce that the exhibit is now officially open! On April 11 the museum hosted a fabulous party to celebrate the opening of the exhibition. The party was well attended, and many of the notable contributors to the exhibit were there. The exhibit will be open until September 15th, so if you are in the area make sure to stop by and check it out! There have been a number of articles about the exhibit in the press, with more expected in the next few weeks. Below is a link to a Boston Globe area that came out a few weeks ago. Not many people travel to northern Maine for Spring break, but we made the trek to Presque Isle at the end of March. We flew into the tiny airport in a little prop plane — we were in search of the old Quackenbush home in Oxbow. Leonard Quackenbush, a hunting guide, lived in Oxbow in Aroostook County, Maine in the mid-twentieth century, about 40 miles south of Presque Isle. His journals from the 1940s and 1950s include detailed observations of the time of leaf out, flowering, and bird arrivals. He even indexed his natural history records towards the end of his life, compiling long lists of observations by species and year. The Quackenbush journals and hand-written indices found their way to the archives at College of the Atlantic in Bar Harbor, Maine. Several months ago we began to dig through these records and analyze the relationship between the timing of these events —leaf out, flowering, and bird arrivals — and local temperatures each year. We also wanted to determine if the timing of these events had advanced since Quackenbush had made his observations due to a warming climate. This work is important as northern Maine has been relatively neglected in climate change research. To gain a better understanding of Quackenbush and his field site in Oxbow, we recently visited the University of Maine at Presque Isle, where we were hosted by Professor Jason Johnston, a wildlife ecologist, and Professor Bob Pinette, a botanist. Upon our arrival, we discovered that we had already made the local papers! We presented a seminar at UMPI — advertised in the Presque Isle Strar Tribune — on our previous research and our hopes for the data in Quackenbush’s journals. After the seminar, Jason brought us to Oxbow, a small community where there are many hunting lodges, where we found Quackenbush’s old house and the red oak trees in his yard. A quick tour of the woods behind his house and along the road reaffirmed our belief that Quackenbush mostly likely made his observations when walking from his house to the nearby village post office. Later in our visit, Jason and Bob agreed to work with us to find recent records of plant flowering times, tree leafing out times, and bird arrival times to compare with the Quackenbush observations. They also decided to start making these observations themselves in the Presque Isle area. Local birder Bill Sheehan offered to let us analyze his observations of arrival times made over the past several decades. After being forgotten for half a century, the Quackenbush journals are stimulating a flurry of research on climate change in northern Maine. 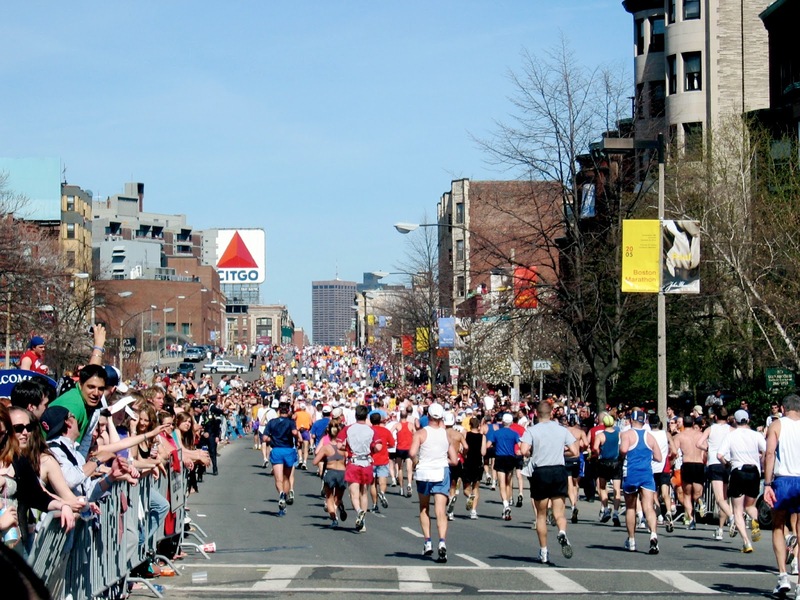 Are warmer temperatures slowing the Boston marathon? Runners in the Boston Marathon on Beacon Street coming into Kenmore Square. (Photo by Noah Reid). example, fell only one degree short of the all-time high at 89⁰, while in 2011 it was a chilly 57⁰. probability of slower race times is bumped up to 95%. sports, and physical fitness training. Figure 1. 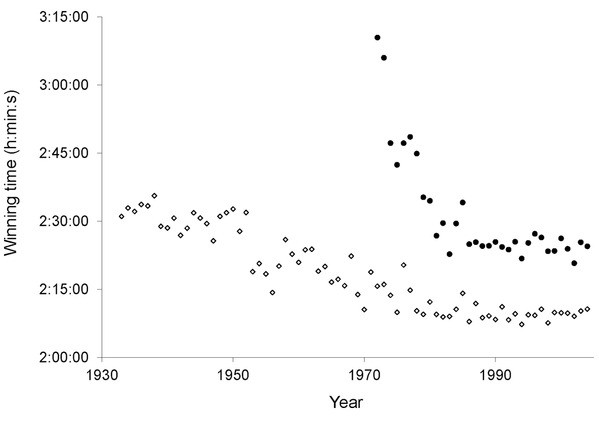 Winning times for the Boston Marathon for men (diamonds) and women (black dots).